MENLO PARK, Calif., Aug. 28, 2018 /PRNewswire/ -- There's good news and bad news when it comes to how satisfied U.S. workers are with their compensation. The good: 49 percent of professionals surveyed by global staffing firm Robert Half feel they are paid fairly at their jobs. The bad: 46 percent think they are underpaid. The remaining 5 percent admitted to feeling overpaid. More than 2,800 workers in 28 U.S. markets were surveyed for the study. The research was issued in conjunction with the release of the Robert Half 2019 Salary Guides, which provide starting salary ranges for more than 460 roles in the accounting and finance, technology, legal, creative, and administrative fields. View an infographic of the findings by city. Data tables with a breakdown of the results by age, gender, income and education are also available. Workers were asked, "In your current job, do you think you are …?" 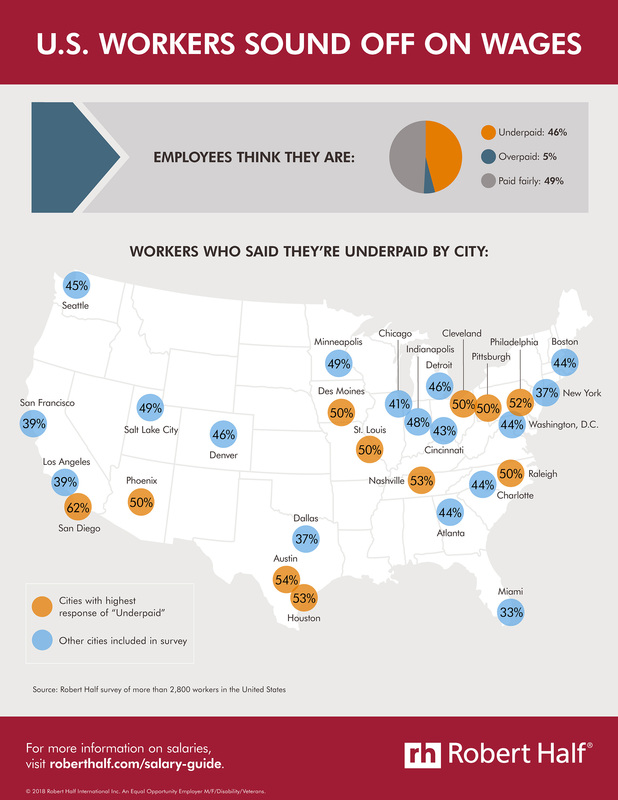 Cities with the most workers who feel underpaid: San Diego led the pack (62 percent), followed by Austin (54 percent), Houston (53 percent), Nashville (53 percent) and Philadelphia (52 percent). Cities with the fewest professionals who report being underpaid: Those in Miami (33 percent), Dallas (37 percent), New York (37 percent), Los Angeles (39 percent) and San Francisco (39 percent) were least likely to say they felt shortchanged. By age: More workers ages 55 and older think they are compensated fairly (52 percent) than those ages 18 to 34 (44 percent) and 35 to 54 (51 percent). By gender: Women (49 percent) were more apt to feel underpaid compared to men (44 percent). By education and income level: Respondents with a bachelor's degree or higher, as well as those earning more than $100,000 per year, were most likely to say they're being paid fairly (50 percent and 57 percent, respectively). Paul McDonald, senior executive director for Robert Half, noted reasons why pay levels may not feel up to par. "Some firms have not kept up with shifts in market demand and continue to use old job classifications and salary bands. If your organization has not reviewed its compensation plan within the last six months, it could be outdated." 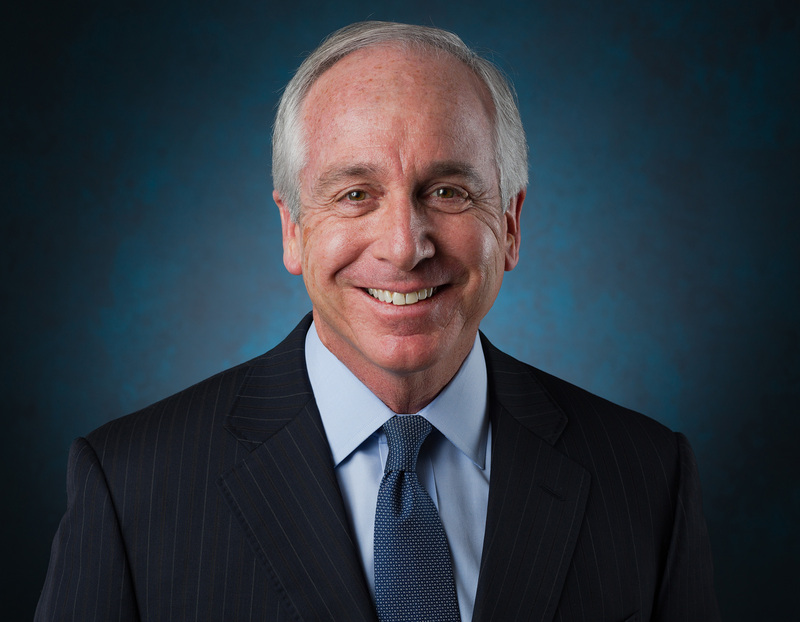 While money is important, McDonald urged companies not to rely exclusively on high compensation to motivate employees. "Professionals earning a healthy salary may still feel undervalued or underappreciated for their contributions. Pay alone does not guarantee employee satisfaction or happiness. Organizations need to offer solid benefits, perks and incentives, along with a positive corporate culture, to attract and retain top performers." Robert Half has reported on salaries yearly since 1950. The company gathers information from its specialized recruiters throughout its U.S. offices to compile the Salary Guides. Information in the guides is based on the thousands of job searches, negotiations and placements managed by Robert Half's staffing and recruiting managers. Continuing or ongoing salaries are not reported because many external factors — such as seniority, work ethic, job performance and training — impact the salaries of full-time professionals as work histories develop.